The "Pro Football Hall of Fame" in Canton, Ohio, supposedly represents all of Professional Football. Yet, of its two hundred and thirty-plus members, only ONE was never in the NFL. That one, Buffalo's Billy Shaw, played his entire career in the AMERICAN FOOTBALL LEAGUE. Yet, at his induction, he wore a yellow coat emblazoned with the NFL logo. Great players like Tom Sestak, Lionel Taylor, Johnny Robinson, Abner Haynes, and numerous other American Football League stars have been ignored by the "Pro Football Hall of Fame", we believe, because they played in the wrong league. This, then, is a Hall of Fame devoted to the players of a league that had a profound impact on Professional Football; a sport that today reflects the AFL's influence in everything but name. The American Football League is now widely acknowledged as the genesis of modern Professional Football. 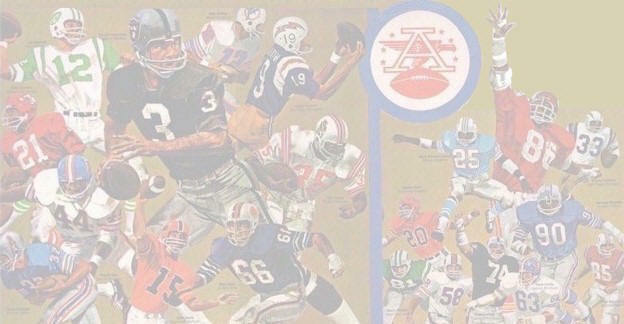 Our Hall of Fame list of American Football League players, coaches, and contributors includes those who, against tremendous odds, got into the "Pro Football Hall of Fame". But it also includes (with names in BLUE) the AFL stars who until now, have not received the honor they so richly deserve. We also include men whose lives (and deaths) after their AFL careers warrant their induction to the AFL Hall of Fame. Names in RED represent those who were in the AFL HALL OF FAME BEFORE they were selected to the other hall of fame. My criteria for admission to the AFL Hall are mainly subjective. Go to the bottom of this page for details. To the AFL greats honored here, and to ALL American Football League players, your fans extend a resounding "Well done!!!" Visit frequently to see additions and improvements. Johnny Robinson Not previously recognized. Lance Alworth Also in "pro football" hall of fame. "pro football" hall of fame. Look at the names in BLUE, below. Can you seriously say that NONE of them belong in the "pro football" Hall of Fame? What qualifies a person to be in the American Football League Hall of Fame? Since it's my Hall of Fame, I set the criteria when I began my Remember the AFL website in 2001. The criteria are admittedly very subjective. I have been a fan of the AFL since its inception in 1960. I agonized over the unfair press the league and its players received from the likes of Tex Maule of SI, Jerry Green of the Detroit Free Press, Pat Summerall and the other NFL shills on CBS-TV, and last, but not least, from the pompous other league itself. I shuddered at the losses by AFL teams in the first two AFL-NFL World Championship Games, and then I reveled in the victories of the Jets and the Chiefs over two successive teams labeled "the best in NFL history". What defines greatness? It's an ineluctable quality best defined by "You know it when you see it." In this case, my memory was the "selector". If I could remember a player's on-field excellence forty years after he performed, and in spite of the dearth of "press" he received during and after his AFL career, that makes him a Hall-of-Famer to me. So, to put it simply, the men in this list are men who I think belong in a Hall of Fame, based on my first-hand knowledge of their prowess during the years 1960 through 1969. I'm open to comments by others, and have periodically added names submitted by others, if I agreed with their assessments. I by no means suggest that ALL of these players belong in that other hall of fame. But look at their names, and their feats, and try to tell me WHY MANY MORE are not in it. I have also included men who are identified with the AFL, but who have been inducted to the Pro Football Hall of Fame. Most of these (excepting Billy Shaw) also spent time in the other league, and in some cases (Paul Brown, Curley Culp, etc.) I include them in the AFL Hall of Fame only because of that other honor. Culp, for example, played only two years in the AFL, winning a World Championship with the Chiefs, but was not on my original list of AFL Hall-of-Famers. Somehow selectors for the Pro Football Hall of Fame believe that because Culp spent most of his career in the other league, his qualifications are better than those of his teammates like Johnny Robinson or Jim Tyrer. I believe that the snubbing of Robinson and Tyrer, as well as other AFL greats, will never be corrected by the Pro Football Hall of Fame selectors, since those selectors are continually replaced by younger men who have no concept of the quality of play in the league that was the genesis of modern Professional Football. They simply don't REMEMBER the AFL.